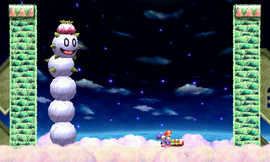 Punkey the Pokey Prince is the boss of World 5 in the game Yoshi's New Island. He starts out as a normal Pokey, but is then enlarged with Kamek's hammer. Punkey attacks by spitting Needlenoses out of his mouth and ramming into Yoshi. The player can hit him by hitting his segments with eggs in order when spikes are not protracting from them. When Yoshi hits his head, Punkey turns angry and starts drilling into Yoshi and eventually calms down but adds one more segment to his body. When hit once again, he adds a fifth segment and is defeated when an egg hits his head the once more. This page was last edited on February 7, 2019, at 01:19.